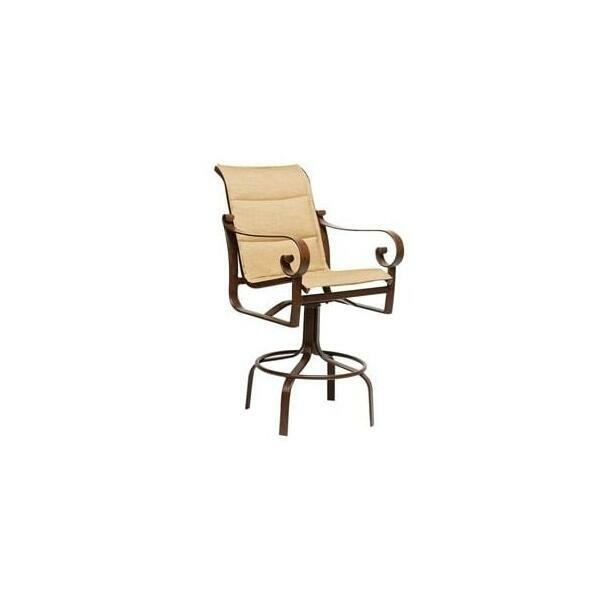 Belden Padded Sling Outdoor Barstools by Woodard are a lesson in simple luxury. This is investment patio furniture, constructed to last for seasons of enjoyment. The Belden barstool frame is a gorgeous design, featuring beautifully scrolled cast aluminum armrests and a lightweight extruded aluminum frame. The entire frame is subjected to an electrostatically applied powder-coating that resists chipping and peeling and can withstand the elements delightfully. 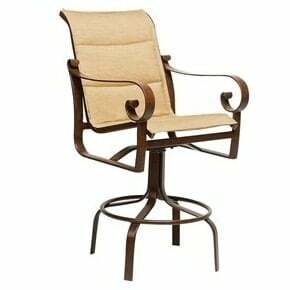 The Belden barstool is typical of the quality Woodard has been putting into their patio furniture for 140 years. The only thing that could make this barstool better are padded slings and it has them! Padded slings offer the convenience of sling fabric with its quick drying, stain resistant properties and then add the comfort of cushion seating. The result is a low-maintenance barstool in which you don’t mind drinking a leisurely glass of wine. Or two. Choose from any of Woodard’s premium finishes and fabrics and make the Belden Padded Sling Barstool your own.